A Marriage Made in Community Planning Heaven! 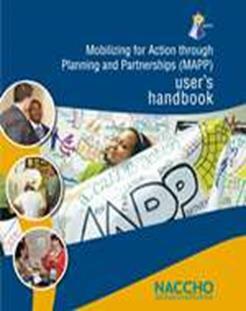 Hot off the presses, the new “MAPP Handbook” is a resource intended for those individuals leading the **MAPP (Mobilizing Action through Planning and Partnerships) process in their communities. It can be used to help MAPP communities move through the process of organizing partners, collecting comprehensive data, strategizing and implementing an action plan. With tips and worksheets to help guide the community through the MAPP philosophy, ideas for engaging local public health systems partners and community members, this is the ultimate guide to MAPP success! What is really exciting to ToP practitioners about this new and improved handbook is that ToP methods, designs and processes have been included and suggested as promising approaches for effective and collaborative tools for healthy community planning. The ICA website is also referenced for those interested in obtaining ToP training and/or accessing facilitation assistance. Public Health in ToP (PhiT), indeed! ** MAPP is a model for community health assessment and health improvement planning developed by the National Association of County and City Health Officials (NACCHO) with support from the Centers for Disease Control and Prevention (CDC).